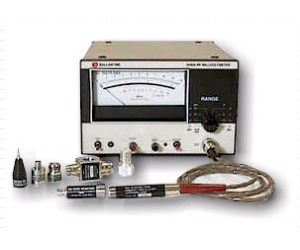 The 3440A measures the true rms of low level RF and microwave signals to over 1GHz. High rms accuracy, traceable to NIST, is assured regardless of waveshape. Common calibration errors are eliminated through temperature compensation of the probe detector diodes; double shielding protects the interchangeable probes from rough handling and pickup. Relative gain or loss measurements are simplified by a 0 dB reference adjustment. DC output proportional to the ac input is provided for analog recorders and to allow operation as an ac-dc converter.